Bob Lehrman, a self-described ‘non-gamer’ and adjunct professor of communication at American University, takes an unusual look at the video game industry, in this week's Christian Science Monitor Sunday Magazine cover story. Lehrman's review features interviews with gamers, designers of the best-selling new game, Skyrim, faculty and students at one of the nation's best college game design programs, a Congressman and others. While covering shortcomings, Lehrman, finds a lot to like in an industry that's come a long way since Pong and has changed in ways the mainstream media doesn't cover. "My image of the industry stems from the 1990s when my kids were home," says Lehrman, author of four novels and a former White House chief speechwriter for Vice President Al Gore. "It's come a long way." Pointing out that the industry is now a $25 billion a year industry just in the U.S., Lehrman covers the economic impact of the industry, as well as it's dominance in entertainment. "Film gets more publicity than games. But look at the numbers. Harry Potter sold the most tickets at the box office last year—about $380 million—Skyrim sold almost twice that in its first month." 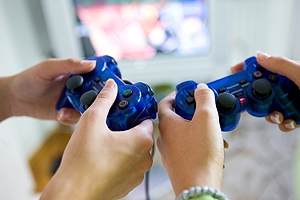 And while virtually every teenager plays, Lehrman says, “the average gamer is 37. It's not something kids outgrow." In addition to economic impact and artistry, Lehrman examines the question of whether games are art, what makes them pleasurable, and whether the violence of many role-playing games makes players more violent, and the rise of so-called "serious" games—games used to educate, provide therapy or examine questions of policy. Lehrman's story is one of three he has produced in the last year for the 104-year old Monitor, which went online in 2010 except for the Sunday Magazine. This week’s story features a number of American University ties, including interviews with AU Freshman and gamer Matthew Fries; School of Communication Professor David Johnson, who teaches AU’s only course on video games; and alumnus Congressman Jim McGovern (D-MA) '86. "That was partly coincidence," Lehrman says. "When it comes to academia, I was really interested in the program at Worcester Polytechnic Institute." According to Lehrman's article, game design, unheard of on campuses a decade back is now a major at 300 colleges. Named adjunct of the year by American University in 2010, Bob Lehrman is best known for his book The Political Speechwriter's Companion, which drew bipartisan praise when CQ Press published it in 2009. His novel Juggling was an American Library Association Best Book, and his The Store That Mama Built was one of three nominees for the National Book Award for Juvenile Literature in 1993. He speaks and writes frequently about politics, with op-eds in Politico, AOL News, Washington Post, and other publications, and co-runs the blog, Punditwire with AU colleague, Professor Leonard Steinhorn. And did his month-long foray into the world of video games make a gamer out of him? "Not yet. But it doesn't bother me anymore that my son plays," Lehrman says, adding that without his son's tutoring he never would have known enough to write the story.